Carmel in Chocolate Mahogany Exterior Door Slab A door that is already hanging on its frame (jamb) is what we call a Prehung door. This self-containing system has a door slab, hinges and frame (jamb). Feather River Door's Prehung Door Systems are assembled to achieve an ideal fit and proper alignment of all hardware. Prehung Door System is available for Feather River Door's Exterior, Interior and Patio Doors. A small change can bring big improvements for your home. Feather River Door's Interior Doors offer a wide variety of styles that can work for many areas of your home. 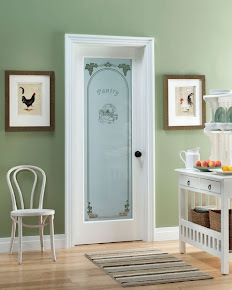 Spruce up an ordinary kitchen with a new pantry door or add style to your master bathroom with a decorative door. Check out our Interior Door Builder to see all of your choices! What is better than black interior doors to make a striking impression? It is a great idea that can work for both offices or homes. Please ask the Home Depot millwork specialist for color chip samples or take a look at our brochure. Are you planning on checking out our stocks doors? At the Home Depot's Door department, look for the bright blue sleeves at the beginning of an aisle. Our stock doors are lined up as shown above. Feel the sturdiness of the door with your hands and look closely at the details in our beautiful glass designs. Read the Jamb label for the specifics. These stock doors are ready to be picked up and installed right away. Don't hesitate any longer to check out Feather River Door's stock door selection! If you are ready to replace your front door this weekend, there is no need to wait! 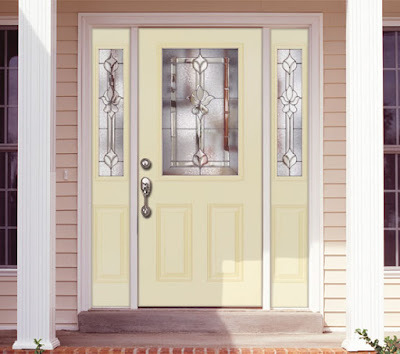 Eight of Feather River Door's most popular fiberglass exterior door designs are ready to be picked up at all Home Depot stores. 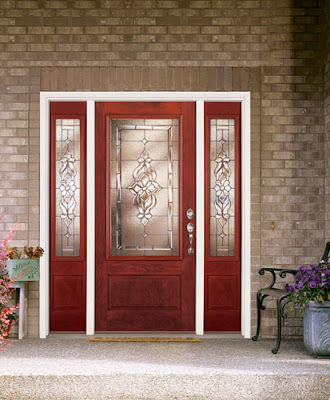 Our stock doors start at low $300 and comes in various glass designs and finish colors. Feather River Door's Stock doors offer quality at a great value at your convenience. Go see them at your nearest Home Depot store! Even if you don't have an opening big enough for French doors, you can still get the openness while letting in more natural light with a single Patio door. How to Achieve: Choose from Medium Oak or Smooth White patio door depending on your home decor. Check out our Patio Door Builder for our broad selection of Patio doors. 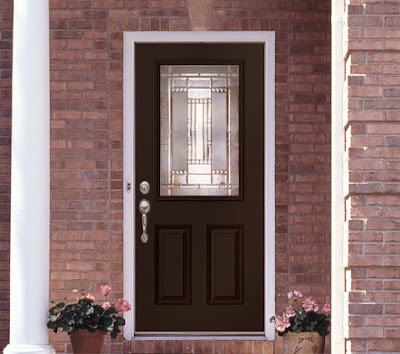 In Feather River Exterior Door's Lakewood Collection, Granite glass is not contained in all glass styles. 3/4 Oval (Smooth & Oak Finish), Full Oval (Oak Finish) and Transoms do not contain Granite glass. Center Arch and Sidelite glass designs are slightly different from the rest of glass styles available. Our catalogue offers glass images in all shapes and sizes, however if you need additional help verifying, please contact Feather River Door's Order Assistance at 1-866-280-3133 where our customer service agents will gladly assist you. You can also email info@featherriverdoor.com. Fleur De Lis: great for Consulting businesses Many people are starting businesses these days and working from offices in their homes. Having a great Office door to greet customers not only makes a great impression, it separates 'work' and 'play' for the business owner as well. 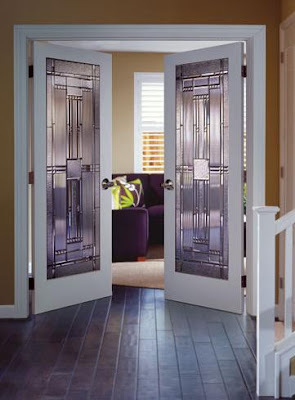 Take a look at Feather River Door's extensive line of Interior doors. From our Office door to Crown Jewel collection, it offers you many designs to suit your business. It doesn't have to be expensive to make a grand impression. Feather River Door's Pre-Painted Program offers you a One Stop Shop convenience, ease of mind and good looking colorful front doors. There are additional benefits that deserves to be mentioned. It's "Green": Our paint process uses water based paint and the latest 'green technology' spray equipment to help reduce solvent emission and help promote better air quality and greener environment. Two year warranty: It is backed by a two year warranty, double the industry standard. The doors also come with a touch up pen. 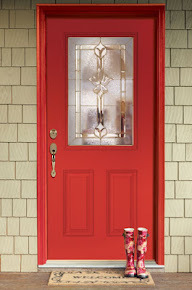 It is a great way to get the colored front door you want without the hassle.